At Two Spirits Ltd... we have it all"
We have a river-front tent campground available, with picnic tables ,fire rings and grills. RATES , MAP , & More info and pictures. CLICK HERE !!! The Ouachita River in Western Arkansas features some of the most spectacular scenery in the Ouachita National Forest and in the South United States. There are float trips available for everyone from the beginner to the the experienced paddler. Two Spirits Limited Canoe Adventures and Campground is located in the heart of the Ouachita National Forest, 45 minutes West of Hot Springs Arkansas and situated along the banks of the Ouachita River. The Ouachita National Forest is the South's largest and oldest National Forest. We are located on the Eastern slope of the Ouachita Mountains. Our camp is only about 15 miles upstream fr om Ouachita Lake, rated as one of the cleanest lakes in the USA by the EPA. Ouachita River floaters experience beautiful scenery, wildlife, clean water and good fishing as the river flows past forested hillsides, pastures and massive rock bluffs. You can enjoy an exciting river float with lunch as a day trip; or you can include a relaxing campout under the giant pines and hardwoods with a mesmerizing evening around a flickering campfire under the stars. 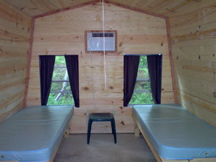 NO need to pack a lot; everything is prepared for you...food, cabins with A/C and canoe gear. Just bring an ice chest with your favorite drinks, a sleeping bag ( lawn chair ) & ...you're ready!" "The Whole Package, all you need is an ice chest !"